Today was a big day in our family and at Little Church on the Lane. First, Faith had her first day in her new Sunday School class. She is now upstairs with the big kids in a kindergarten/first grade class. Helen Gulledge is her new teacher. Amazingly, there were six kids in the class. That is pretty big for Little Church. I am so glad it went well. Although there are five boys in the class, I am glad that she has kids her age to be with. The second big thing that happened was that I spoke to the congregation about “peace”. One person each week has been talking about The Fruit of the Spirit: love, joy, peace, patience, kindness, gentleness, faithfulness and self control. I chose to talk about peace. I referred to the time when Faith was first born and my dad told me that he had prostate cancer. I was so afraid that he was going to die. I cried and prayed to God to cure him. During my prayer a verse from Isaiah that I had memorized popped into my head, “You will keep in perfect peace, him whose mind is steadfast because he trusts you.” All of a sudden a wave of peace came over me. I trusted God and trusted His word. I knew that my dad was going to be okay. I no longer worried about him because I knew that God had given me a promise: a promise that cancer would not kill my father. I had a supernatural peace about the situation. That was the peace that I spoke of yesterday. Then it was my Dad’s turn to point them to that peace. He announced to the congregation that he would be retiring as the Head Pastor of Little Church on the Lane after 19 years of service. They were all shocked. You could hear a pin drop. Nineteen years is a long time to work at one place and to build relationships with the people there. Many of them were members when he first arrived at Little Church, members that he has married, and members that have grown up there. Dad wants to retire, play golf, and play with his grandchildren. He will have five more weeks at Little Church before he retires on November 3rd. Believe it or not, the day was just beginning. After church the kids and I drove 30 minutes up to Davidson, NC to see Tom complete his second Half Ironman. He finished in 6 hours 25 minutes. He said that the run course was very hilly. From now on, he is racing closer to the beach….less hills. The kids and I cheered him on at the finish line. We were all very proud of him. It takes a lot of training and dedication to complete a race like that. (Better him than me.) After the race the kids played in the two bounce houses that were there while Tom rested. Way to go Tom!! Yesterday was a very exciting day in our household. We all finished the race that we were given! This entry was posted in Uncategorized on September 30, 2013 by Becca. Some times I look at the kids and think, “I sure hope I remember this moment and others like it.” In all reality, I doubt I will. I will remember some parts of it, but not the details that I find so special. Tonight I took the kids out to dinner at Chic Fil A. Chic Fil A is the best fast food restaurant in the south. They have the best customer service and real chicken nuggets. They also have a play area at every restaurant. It is great! Tom had a lot of work to finish tonight so I made sure that we were out of the house and out of his hair. 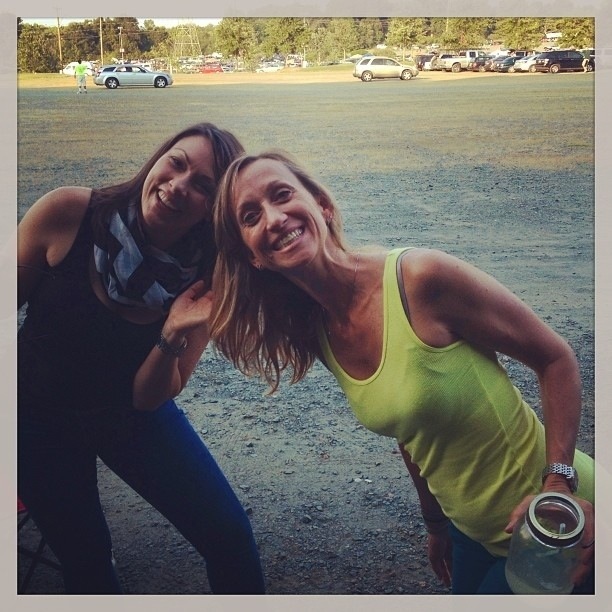 We had a great time….as usual. As I sat and watched the kids play on the outdoor playground, I became very sentimental. I watched the way that they interacted with each other and laughed together. Little Miller would laugh and chase after the older two. When he needed help getting up a big step he would yell, “Faaaaaif. Up” Faith would run over and pick him up by his waist and toss him up the big step. Then they would all slide down the big curvy slide together. And then do it all again. I realized that these moments in time are fleeting. In six months to a year it won’t be like this. Hopefully, they will all be playing together and having fun, but Miller will be older and more independent. I love that my kids love each other. Faith is so nurturing to Miller. She really loves her little brothers. Wilson is becoming a helper as well. He rarely hits Miller back or retaliates in anyway and he looks out for his little brother. They were just so cute tonight. I could just sit and watch them and take it all in. I hope that I always remember how cute they were together. I want to take mental pictures of them and pray that they never fade. It makes me cry that these days will pass. I know that the next phase will be fun and I will feel the same way about those memories. I guess that is why I have a blog and have put videos up on You Tube: so that I don’t forget. Thank goodness for technology. This entry was posted in Uncategorized on September 23, 2013 by Becca. Tom and I were invited to his cousin Bethany’s wedding in Atlanta this past weekend. Atlanta is four hours south of Charlotte so it was easy for us. 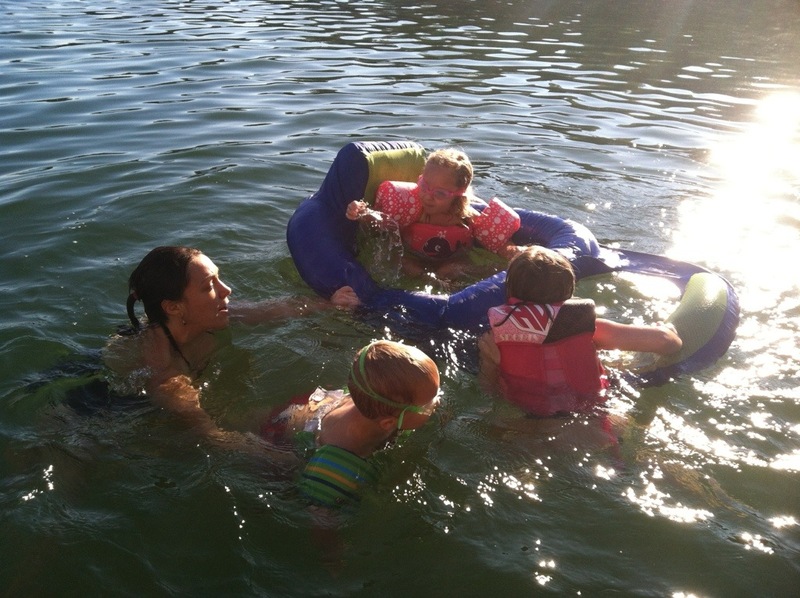 We planned a fun weekend of childcare for the kids and two days of relaxing for us. The kids were all over the place: Lisa’s house, soccer games, birthday parties, mom’s house, Abigail’s house and Sidney’s house. They were not bored at all! I don’t even think that we were missed. As for Tom and I, we relaxed. We drove down to Atlanta Friday night and arrived around 10:30. I even took a nap in the car. We slept in Saturday morning, had breakfast at the hotel, watched TV, took another nap, and then finally went to the wedding. The wedding was very classy and so was the reception. I love going to weddings. You get to see a couple that is in love and so hopeful for their future. Everyone is celebratory and enjoying themselves. I get to spend time with my husband, have a few drinks, eat a nice dinner, and get dressed up (which I rarely get to do). Tom was also able to spend time with his 93 year old grandmother, Granny T. She is smart as a whip! I hope that I am as with it as she is when I am 93. I think she is more with it than I am now! It was a great weekend. Tom and I really needed to get away together. It is so important for us to have time away without the kids. We can finish a thought without being interrupted and laugh at things that we usually don’t get the chance to laugh at. It definitely strengthens our marriage. I am very thankful to have so many friends and family to help us accomplish this goal. Today was a great day. It was the perfect combination of relaxing with a friend, doing stuff around the house, and playing with the kids. Now that Faith and Wilson are gone almost every morning during the week, I have a lot more time to myself. I used to have all three of them, all day, five days a week. Now I am down to having them only in the afternoons, five days a week. What a difference that makes! I still haven’t perfected what to do and how to enjoy myself. Some days I run around town doing errands or going to appointments. Other days I run around the house picking up clutter and doing laundry. Today, however, I mostly sat down and enjoyed myself. After I dropped of Wilson at school I took Miller over to Sidney’s house to hang out, drink my coffee, and chat it up with her. Jesse and Miller played while we talked for an hour. It was very nice. After that I came home, made lunch, and played with Miller until it was time to get the kids from school. After school we all came home, Miller slept and the older two watched TV for an hour while I paid bills and did other things that needed to be done. After school TV has become part of our routine. They need time to chill out, have a snack and relax before homework starts. After TV the homework needs to be done. Faith loves doing her homework. She happily colors and cuts and traces her letters. We even played a pleasant game of “Sight Word Memory Match”. The weather has been absolutely gorgeous!! It has been in the seventies all week. After Miller woke up from his nap we all decided to go to Boyce Park. Faith rode her bike while the boys sat in the double stroller. Wilson and Miller ran some, but mostly rode. It is about a twenty minute walk through the woods to the park. This time we went with a tee-ball bat, ball, and tee. We also brought a soccer ball. The kids never even went to the playground. We just played tee-ball and dug in the dirt. Miller had on a white shirt that came home orange. (this is why I don’t buy white shirts) I had such an enjoyable time with them. Faith and Wilson took turns batting while I fielded the ball. Miller played a little soccer and we all got a long great! I really enjoyed being with them. Sometimes these trips can turn sour at some point which ruins the whole trip. Not this time! Faith rode her bike like a champ. She even rode it downhill on slippery rocks and dirt. I told her that she was mountain biking and she was very proud. I am so glad that we have the greenway right outside our door to enjoy and play. Today was a great day! I was able to balance being Becca and being a mom. I have been more mom than Becca over the last four years or more. I hope to figure out this balancing act more often. Today I was good at being both mom and Becca. This entry was posted in Uncategorized on September 17, 2013 by Becca. As many of you know, I love to paint the interior of the house. I feel like I can always improve something with a coat of paint. I am usually right! 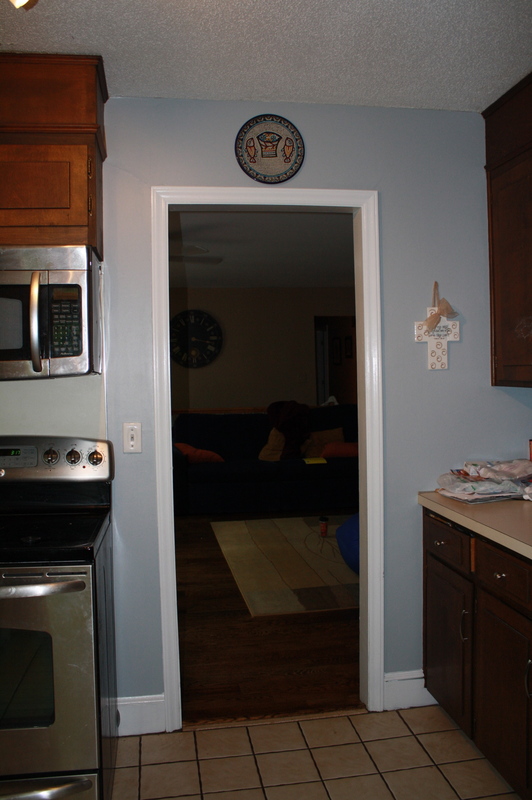 This time, I painted the wood trim in the kitchen. Last month I went to my Aunt Lisa’s house and she had painted her wood trim white. 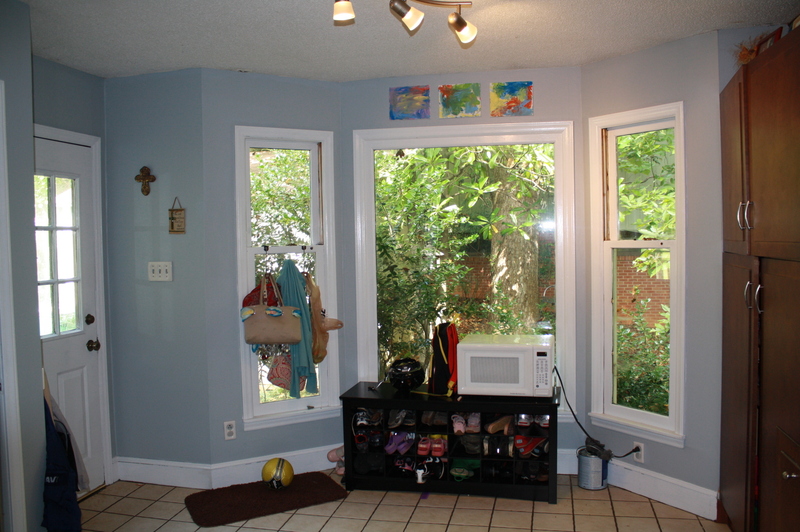 Amazingly, she had also painted the walls the exact same color that my kitchen already was. 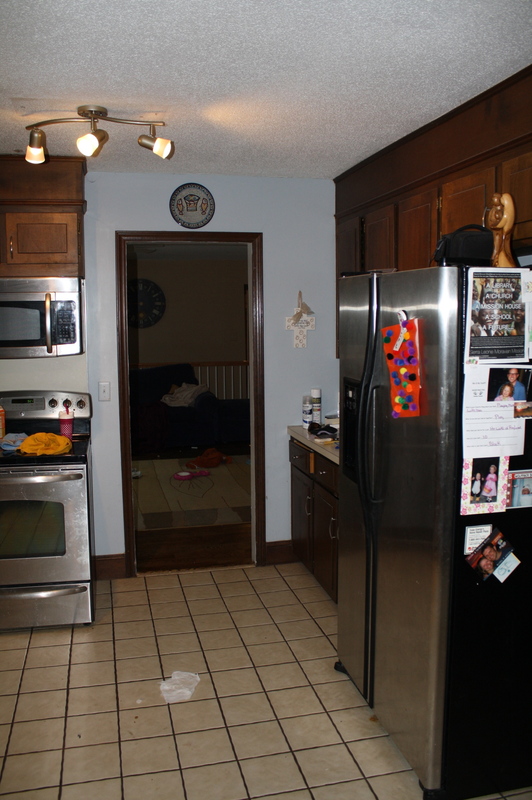 I could immediately see how much better my kitchen would look with white trim. I went home and convinced Tom that he would like it. He gave me the okay and so I went to work. This time, I took before and after pictures. As you can see, the wood trim was dark. I am amazed at how much lighter and happier our kitchen now looks. 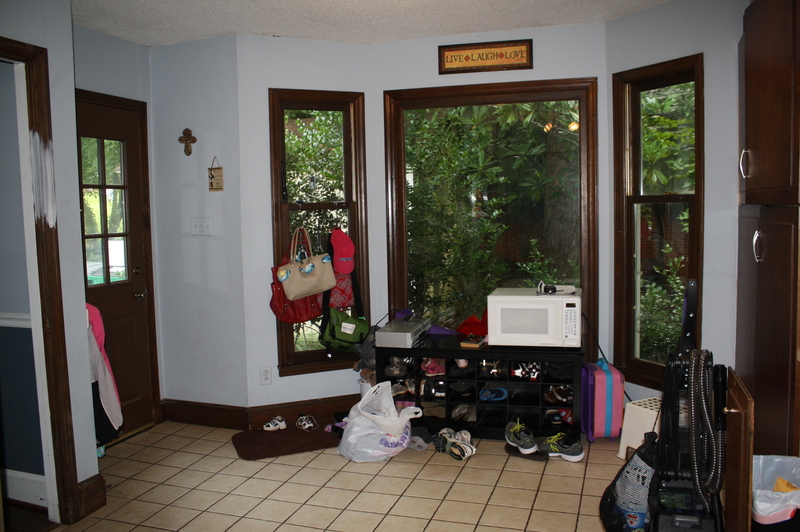 However, regardless of color, there is always a cluster of crap in this area of the house. Sorry…. After a nice coat of white paint on the trim and a new coat of blue on the walls that was the same color. I put some of the kids’ art work above the window. Of course, now that the walls are a pretty and clean white, I can really tell how off-white the floors and counter tops are. That can be my next project. 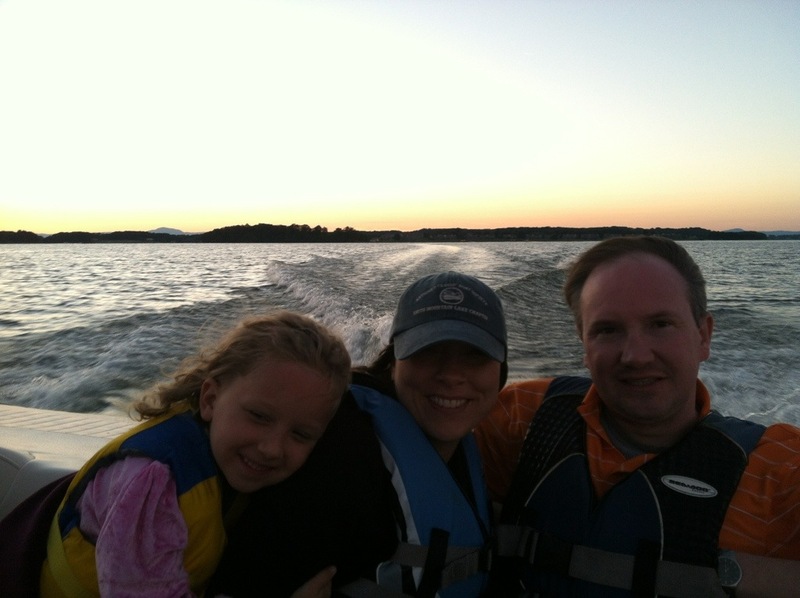 Our neighbors, Abigail and Erik, invited our family to go with them to Abigail’s parent’s lake house in Virginia. 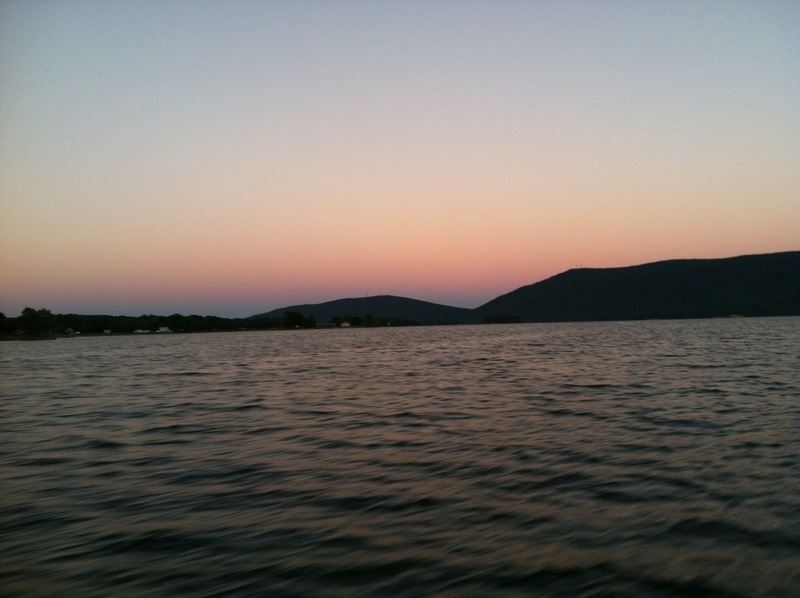 The house sits right on Smith Mountain Lake and has a beautiful view. It is very child friendly as well. The three hour drive up to the lake was very challenging and noisy due to the three kids in the car. That is always the worst part of every trip. The time we spent at the house was great! 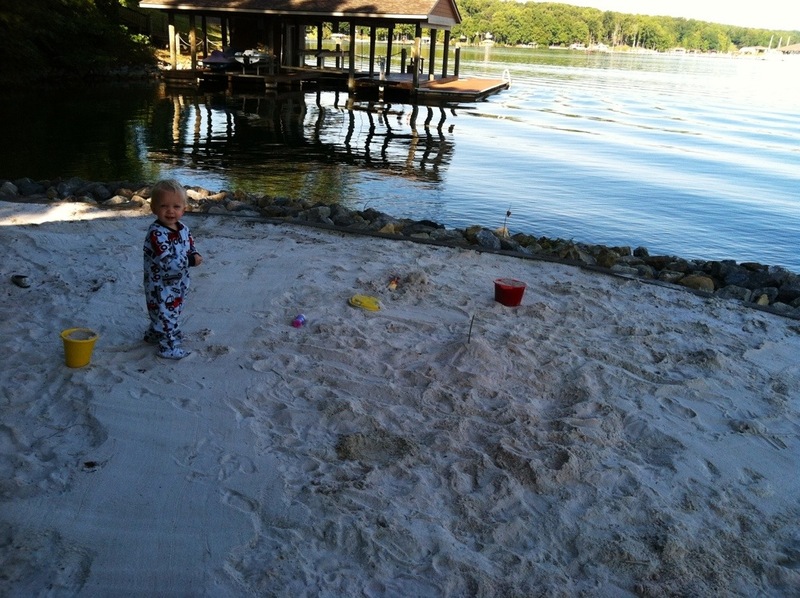 Miller had a sandy beach to play on, the bigger kids swam in the lake and played in the dock, and the adults relaxed and talked. Abigail’s parents were there an they were vary nice and hospitable. It was a place that I felt free to cook myself something or go take a nap without guilt and without tip toeing around. I loved it. Saturday morning the kids jumped right into the lake with Abigail at 8:30. What a new experience for them. Miller played in the sand. We all went to the antique boat and car how for lunch. Luckily there was a beach for the kids to play on while qe were there. The funniest part of the afternoon was Wilsons cleaning episode. He was upstairs brushing his teeth when he came downstairs with a towel covered in toothpaste, toms toothbrush and some toothpaste. He smelled very minty. I asked him what he was doing and he said that he was putting toothpaste on the floor and smearing it around with his hands. Then wiping it up with the towel. He said he was pretending to be a floor cleaner. I asked him very sweetly if he was using Daddy’s toothbrush to clean the floor. He said,”just a little bit”. Lol!! I then told him I thought that it was very nice of him to clean the floors for us and he said,”yeah, I am pretty proud of myself”. He is a true character. After dinner we all went for a boat ride. Very fun! The sun set was beautiful. So far the first day was great fun. This entry was posted in Uncategorized and tagged Abigail, lake, smith on September 15, 2013 by Becca. I have wanted to see Kid Rock in concert since 2002. I love his music. His music ten years ago was pretty crass, but he has cleaned it up a good bit since then. He is on my “I wish I would have seen him before I became a Christian and cleaned up my act” list along with Nelly and Limp Bizkit. Kid Rock finally came to Charlotte last night. We went to the show with our neighbors, Erik and Abigail. It was awesome! We hung out in the parking lot a little bit and then went in to see ZZ Top open for Kid Rock. We had bought lawn seats because they were only $20 and the others were all sold out. The name of the tour was “The best $20 night ever”. Kid Rock made sure that the tickets were affordable, had cheaper beer in the show, and had $20 shirts. Kind of noble of him. He said he could take a pay cut so that more people could enjoy the show. It paid off because the entire Verizon amphitheater was packed. As we walked in the front gate there was a tent that had open VIP box seat tickets for sale. We decided to upgrade our cheap lawn tickets to VIP. It came with a significant price increase, but I didn’t care. This was my one chance to see Kid Rock up close and I was going to take it. It was worth every penny! Tom and I danced and had fun all night. We could see the stage very clearly, had plenty of space, and thoroughly enjoyed ourselves. Kid Rock opened with “I’m Going Platinum”, one of my favorites. He closed with “Ba-Bita-Ba”. A classic. I will definitely go see him again in concert. He put on a heck of a show. This entry was posted in Uncategorized on September 11, 2013 by Becca.